In a food processor, combine all of the ingredients except for the olive oil. Pulse until coarsely chopped. With the motor running, drizzle in the olive oil. Taste with a spoon and season with more salt if needed. Several of the ingredients are salty, such as the anchovies and Pecorino, so it’s best to taste first before seasoning. Preheat a grill or grill pan. Season the branzino with the olive oil, salt, pepper, lemon zest and rosemary. Grill skin-side down until cooked through, about 4 to 6 minutes per fillet, depending upon size. 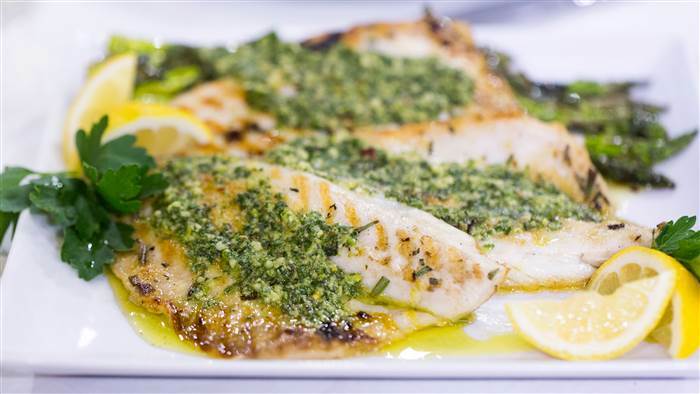 Plate the grilled branzino fillets and top each one with a dollop of pesto. Finish with a drizzle of extra-virgin olive oil and freshly grated lemon zest. Serve immediately.